Irish and Chin-Diehard Alliance member Bling Dawg is closing out 2010 with a bang, as the seasoned dancehall artist brings the heat on "God Mi Seh" -- his new single on Dave Kelly's "Turn It Up" riddim. Born from the highly publicized reunion between Bounty Killer and Baby Sham/Dave Kelly, "God Mi Seh" is deemed as Bling Dawg's official comeback. The ever-so-humble Bling Dawg was honored to record with the influential Reggae producer saying "Dave Kelly is at the top of his game....he really makes you work hard.....with him, it's not about just coming to the studio and dropping some quick lines." With so much music being put together nowadays without much thought, he adds "Dave Kelly makes real authentic dancehall music." Making timeless, authentic dancehall music is exactly what inspires Bling Dawg, leading him to always invest in mastering and perfecting his craft. 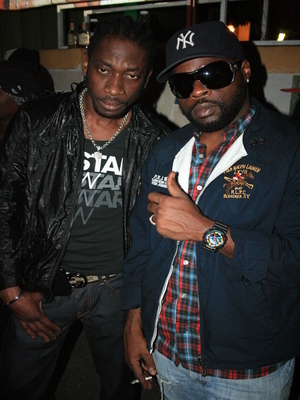 Among the dancehall fraternity, Bling Dawg is highly respected for his lyrical dexterity. Often billed as a lyrical architect, Bling Dawg's music invokes much thought. Bling Dawg says "I do more than just create music with ABC lyrics....music is much more than that to me." Because Bling Dawg's music is complex and truly based on skill, often it has not always skyrocketed commercially. Yet, Bling Dawg has always remained relevant in the industry. As a strong supporting force behind-the-scenes of the Alliance, Bling Dawg is highly visible in the streets. Even when Bling Dawg slowed down his music career, he maintained a strong presence and prospered as a prominent promoter, business man and family man. "Music has always been my passion," says Bling Dawg. "But in this often uncertain industry, diversity is critical for career longevity and relevance." With "God Mi Seh" bubbling on Caribbean radio stations and thriving as a favorite selection in the dancehalls among top selectors , it's no surprise that a video is in the works for January. In addition to this single, Bling Dawg is also garnering attention from the dancehall massive for songs "Next Level" (Baby G's 'Badda Dan riddim), "Nuh Stab Mi in Mi Back" (Tan Bad riddim ) and "Our Name" (Saudi Arabia riddim ). Bling Dawg is poised for a prosperous future, with a mixtape and numerous projects in the works for early 2011. Bling Dawg, christened Marlon Williams, burst onto the music scene in the late 90's with a groundbreaking appearance alongside Beenie Man on "Circumstances." Throughout his career, Bling Dawg has delivered such vibrant dancehall classics as "Kiss My Baby Good Morning ," "Say My Name," and "Shotta Ting" among many others.